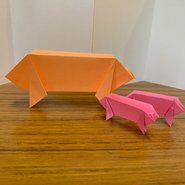 Let’s celebrate the Lunar New Year of the Pig with Origami expert Michael Clonaris. Under Michael’s expert guidance, you will learn to make a special origami pig sculpture to bring good luck for the year. This fun collaborative workshop is designed for children and their grown ups to work together. You will make a range of origami sculptures in a variety of different animals using traditional origami paper. The workshop is suitable for children aged 7 years and up with a parent or guardian. All children must be accompanied by an adult (included in ticket price).